I recently went with my family to visit Carlisle Castle. What a surprise it was. Almost 900 years of history packed into one place - and what a history! 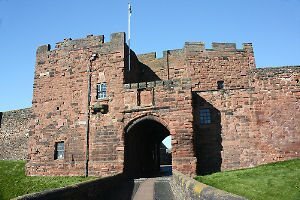 Carlisle Castle has played a role in some of the most colourful and significant periods in British history. being the last English fortress ever to suffer a siege - in 1746 during the Jacobite Rising. Bonnie Prince Charlie's garrison of men were unable to hold off the Duke of Cumberland's army only to become prisoners there themselves. Many of them died in the castle. Taking a tour of the castle was both interesting and enjoyable. The architectural features were very notable as one would imagine of a truly medieval castle and there were some particularly fascinating things such as the stone carvings in the great Keep believed to have been made by prisoners in 1480. I am saving that topic for a more detailed blog with photos later on. The exhibitions are really well presented with many artefacts on display. 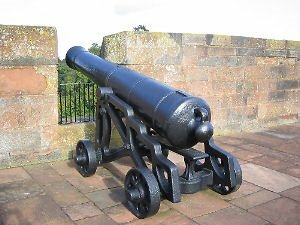 Walking around the castle walls offers fantastic views over the city of Carlisle and the wonderful black cannons were really impressive! (See photo) The military history of the castle is reflected in the wonderful Border Regiment & King's Own Royal Border Regimental Museum which is housed within the castle walls and to which you get free entry when you purchase a ticket to tour the castle. There is so much to Carlisle Castle that a single blog post just can't do it justice! You have to go there to believe it and if you can't get there then revisit this Blog and medieval-castle.com where we will be developing further content on what must surely be one of the best medieval fortresses in England, possibly second only to the Tower of London.